This week the New York Times Editorial Board endorsed several measures that Catholic Migration Services and Queens tenants have been advocating to Albany legislators. These proposals would eliminate some of the loopholes in state laws that currently allow landlords to impose significant rent increases that often make rent regulated apartments unaffordable. Catholic Migration Services has been working closely with tenants and coalition partners to advocate for the critical changes now supported by the Times. These changes include restricting how landlords can eliminate “preferential rents” and eliminating the incentive to evict tenants (“vacancy bonuses”). 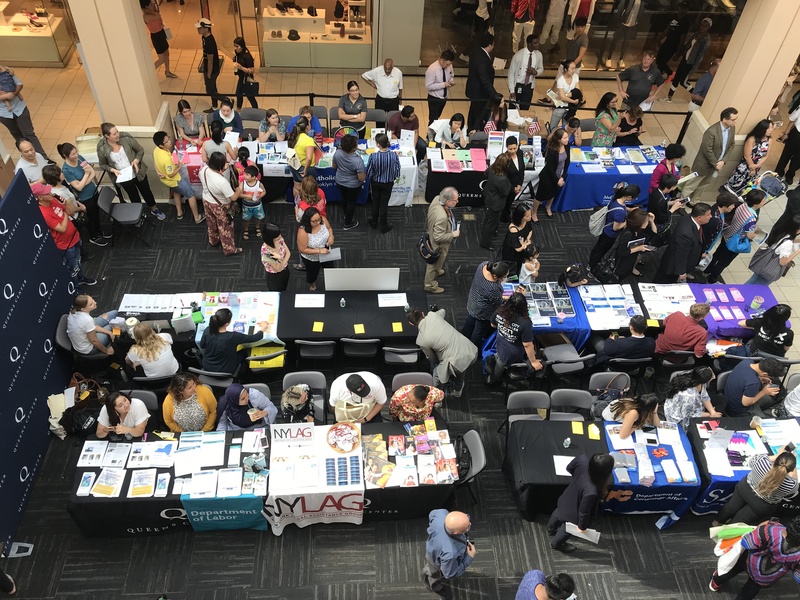 In a joint effort with Queens Borough President Melinda Katz, Catholic Migration Services will participate in Know Your Rights Week in conjunction with U.S. Congressmember Gregory Meeks, U.S. Congressmember Grace Meng and in partnership with State Senator Michael N. Gianaris, State Senator Jose Peralta, State Senator Toby Ann Stavisky, State Assemblymember Jeffrion Aubry, City Councilmember Daniel Dromm, and City Councilmember Rory Lancman. Click here to download the event flyer as a PDF. Right to counsel coalition members, tenants, and community leaders gathered for town hall forum on legislation signed into law August 2017. 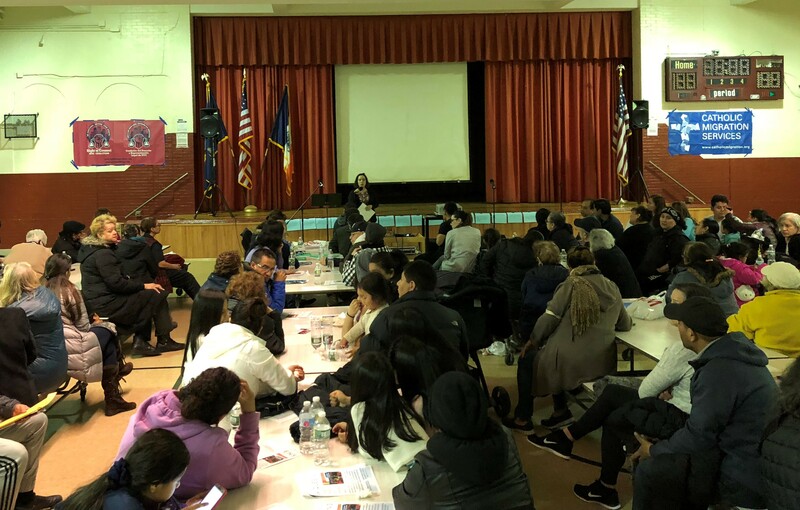 On Thursday, April 12th right to counsel coalition members, tenants, and community leaders gathered for a Town Hall Forum in the gymnasium of St. Bartholomew Catholic Academy in Elmhurst, New York to address legislation signed into law on August 11, 2017. 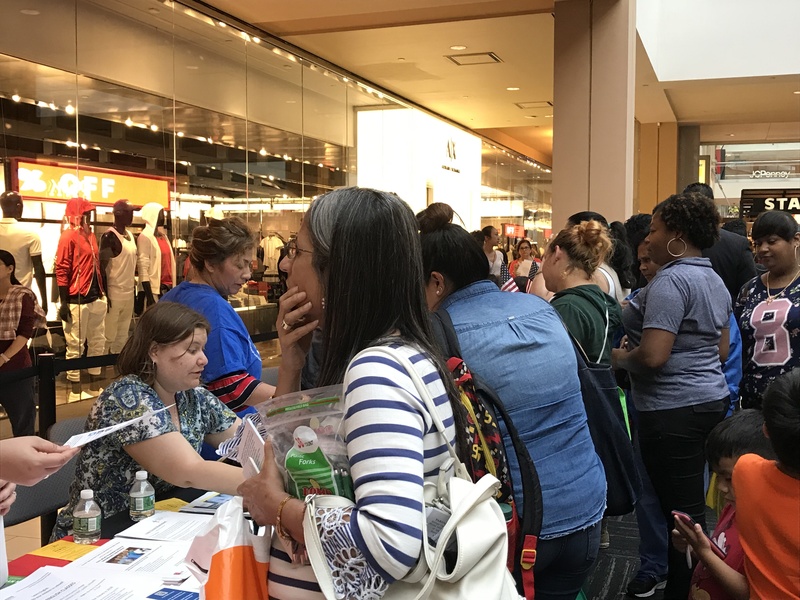 Right to Counsel mandates universal access to legal representation for low-income tenants in New York City and is the first City in the nation to establish this type of legislation. Coalition members, tenants, and community leaders highlighted the history of Intro 214 and its amendments originally introduced in March of 2014 by Council Members Mark Levine and Vanessa Gibson. 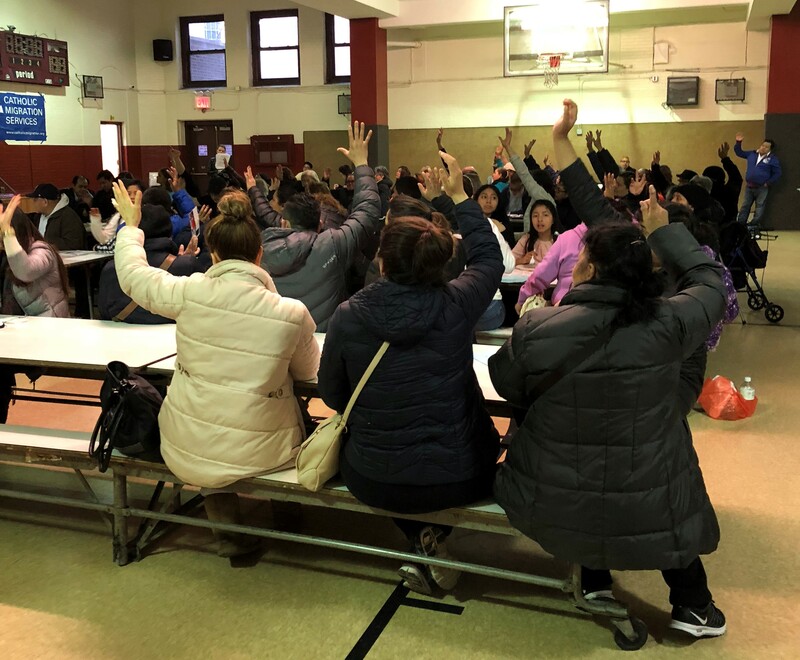 Approximately 150 Queens tenants packed the school gymnasium to learn why the Right to Counsel is so important, the eligibility requirements, how to find an attorney, which Queens zip codes will begin implementing RTC, and how to build tenant power. Queens tenants raise their hands during interactive forum. After learning that 11433, 11434, and 11373 are the first Queens zip codes to implement RTC, tenants later broke out into small groups facilitated by attorneys and organizers for an opportunity to ask questions, discuss ways to protect themselves and their neighbors, and to complete commitment cards asking tenants to start taking action and ownership of this new tool. Intro 214-B, the final bill that passed last year, ensures at the end of 5 years, all income eligible tenants will be ensured an attorney when fighting their eviction in housing court. Tenants who are over income, have the right to a consultation with an attorney. The bill also provides for NYCHA tenants whose cases happen in administrative hearings, to have representation as well.